"Dom, I’m speaking at a conference in Halifax, Nova Scotia in mid-July. Do you want to join me?" Maureen doesn’t even need to ask me. Of course I’d love to join her for a trip to the Great White North—and a place there I’ve not previously visited. Over the next few months, I’m in touch with a public interest organization in Halifax, which has agreed to set up a speaking opportunity for me in the city. With relief, we fly north from Orlando International Airport on a morning where the news is filled with talk about the strengthening Hurricane Dennis approaching Florida from the south. We are still weary from the overwhelming hurricane pummeling we lived through in Florida in 2004, so we are happy to fly from the looming Dennis. Turns out that Tropical Storm Cindy, which passed near Florida a few days earlier, has been mischievously raining on the northeast as we fly north. We arrival at Newark NJ airport to find a number of delayed flights due to weather. Then the news turns more awful. Halifax airport is doing renovation work, which means that their radar and runway lighting is not fully operational. The airport is not able to accept flights or allow flight departure when visibility is low. And since Halifax has a tendency to be drizzly and foggy for most of the year, the airport is now canceling a LOT of flights. Tempers are flaring and nerves are fraying. Predictably, our Halifax flight is cancelled, which means, to our horror, that we are to spend the next 26 hours at Newark Airport. Speaking from experience, I can say that there are better places to spend a day. Finally, after not being called for three earlier flights waiting on stand-by (with a great many other passengers who are ALSO trying to find a new flight), we depart on an afternoon flight, and we are not as happy as one would think. Our already overly brief weekend to Nova Scotia has now been shortened by a day. Headline news when we arrive in Halifax: "Plane Flights Down and Cancelled at Airport." Looking out the plane window, I see waves and waves of windy drizzle enveloping Halifax. But it is good to finally be arriving here. We make the long drive from Halifax airport to our downtown Bed & Breakfast in our spiffy PT Cruiser convertible. The map suggests that finding our lodging will be easy. But to our great dismay, we soon find ourselves completely lost in the city. Streets are winding and spaghetti-like. Street names are often nearly impossible to see, because they are either tiny in size or nowhere to be found. The situation is not good. After the Newark airport ordeal, we are short-tempered and have little patience for trying to navigate such conditions. We stop at a gas station for directions. We are in a bad mood and lash out to horrified locals standing behind the cash register. "We’re lost in this maze of undecipherable roads!" Thinking back, I am ashamed by my unpleasant attitude there. As we are to learn throughout our stay in Nova Scotia, the local folks at this shop are exceptionally helpful (despite our rude, unhappy, tense attitude), and point out the route we need to take. With the "help" that one normally expects at an American gas station "Quick Mart-orama", the people behind such counters almost always say that they have never heard of the place we are looking for, or have no clue how to get there. In Halifax, happily, things are different. Here at this humble Halifax shop, the people give us understandable directions that even a child could follow. Gratefully, we depart and are soon driving into the B&B parking lot. First thing next morning, we set out in the Cruiser, anxious to put the top down, but not hopeful due to the chilly, wet conditions that morning. We are also eager, as we only have a short time to get a taste of Nova Scotia. Our absurdly ambitious plan is to sample Nova Scotia in less than a day. We drive north, and to our great fortune come upon a visitor’s center. Inside, the woman is exceptionally helpful. She gives us a map and clearly points out the "must see" sights along the way. We are to drive what Nova Scotians call "The Majestic Fundy Shore Drive" along the northern coast of Nova Scotia. The drive is delightful, despite the grey weather. We cannot resist the urge, so we put down the convertible top in the cool, wet weather and turn the heater on full blast to better tolerate the chilly weather. In front of us is a superlative example of a pastoral, authentic landscape. One of those places that appears frozen in time. The drive is untarnished with chain restaurants. No touristy, strip commercial shlock along the way to offend and sicken us. The first suggested stop is Anthony Park, which provides easy access to the Bay of Fundy. We arrive at low tide, and are astonished to find ourselves walking along the ocean floor. 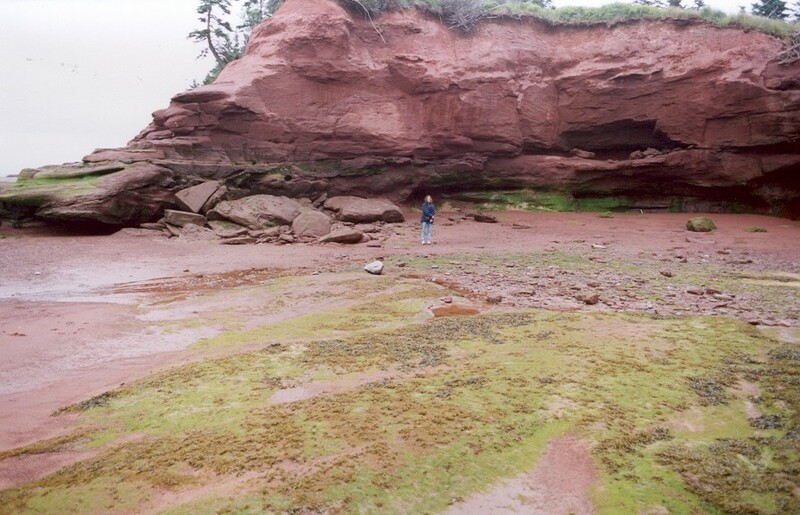 Enormous red sandstone canyon walls tower over us as we walk the muddy, seaweeded floor. I have never seen anything like this before. Quite surreal. The helpful visitor center guide also suggested we stop at a few lighthouses along the drive: Burncoat and Walton. Small, cute, historic lighthouses are found here. At Summerville, she suggested we stop at the Avon Emporium Café for Sunday brunch. Because we had seen miles and miles of signs along Rt 215 advertising the place, I expected the worst. Surely this will be a plastic, bland, regrettable tourist trap. Short of a few dishes Maureen and my mom have made in the past, each item we sample at the Café is simply superb and proudly announces to the diner that what you are eating is HOMEMADE. Unquestionably, unforgettably the best food I have ever tasted at a restaurant. So good that I want you, the reader, to DROP EVERYTHING AND FLY TO HALIFAX THIS MINUTE SO THAT YOU CAN EXPERIENCE THE JOY FOR YOURSELF. Even as I write this several days later, I am still giddy over how delightful the food was. The soft breads, the cheeses, the rolls, the fruit, the chowder, the jams, the scones, the turnovers, the salads just oozed perfection. Even the orange juice was fresh-squeezed. If we had done nothing in Nova Scotia except discover that delightful buffet, the trip would have been more than worth it. I was in a jovial mood for the remainder of the day. My stomach will be forever appreciative. Our good timing this day also enabled us to experience the famous "tidal bore", where the incoming tide is made visible by a rolling wave of water. A wave that allows folks to enjoy whitewater rafting. We were underwhelmed, however. The wave, at the designated overlook, was only a foot or so in height and moved at a slow pace. Ho hum. The tidal bore name is apt, although in fairness I should say that it is rather interesting and unusual to actually be able to see the tide rolling back inland. Just don’t expect to need to frantically flee like a screaming banshee from a roaring, 60-foot tall tsunami wave. We steer the convertible into the small town of Wolfville, which has an impressively human-scaled and vibrant main street. Soon, we find ourselves exploring the southern Nova Scotia coastline, which contains an enchanting assortment of utterly romantic, lovely, picturesque little coves populated with a small number of sailboats. The most well-known and photographed is Peggy’s Cove, about 35 kilometers southwest of Halifax. The stereotypical northeastern fishing village, which is now a gentrified artist colony that has managed to retain its colorful, gritty village charm. 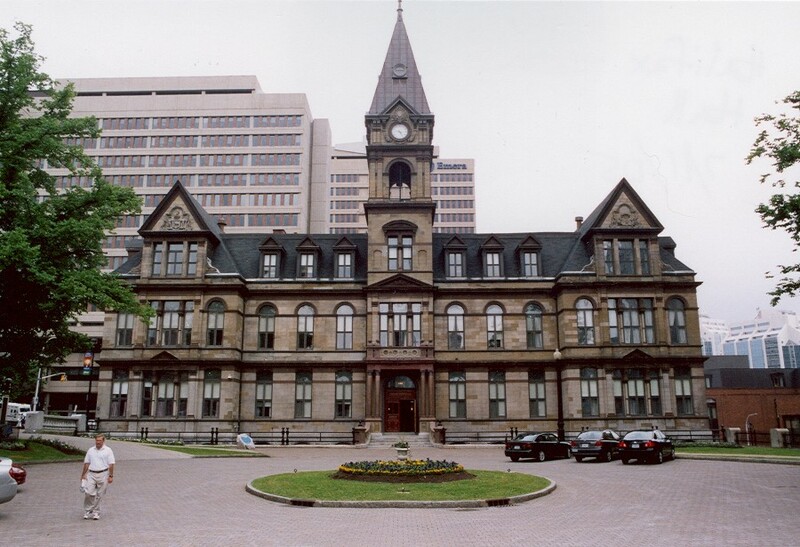 On Monday, I walk downtown Halifax for a few hours as I gather my thoughts for the noon speech at the Halifax Ferry Terminal building. Despite the drizzle, the boardwalk is fairly vibrant, and people appear to have grown oblivious to the less-than-ideal weather that is so frequent here. The downtown has a good number of what could be called "counterculture" shops. Artisians, incense, pubs, microbreweries, and bizarre yet fun shop names (such as "Your Father’s Mustache"). For dinner, we try Sweet Basil Bistro. The place serves an outstanding tofu Pad Thai. I recommend this restaurant. The Granite Brewery, we learn, makes an excellent stout and proudly offers us their sampler of their various beers. We head for Spring Garden Road, which is touted as a vibrant neighborhood. The street is certainly alive with shops and pedestrians. First stop is Rogue’s Roost, a microbrewery. Nice ales. McKelvie’s is our dinner destination downtown. Very fresh seafood. Our final Monday stop is The Old Triangle, an authentic Irish pub. There, I order a pint of Propeller Porter. A delicious beer with a chocolatey, coffee-like taste. Back at our hotel room, a voice mail is waiting for me. CBC radio has called to ask if I could do a live, in-studio interview on Tuesday morning to discuss my controversial views about transportation. I inform them that much as I’d like to, it would not be possible as our flight leaves first thing Tuesday. "Can you come in at 6:30 am? That would give you time to get to the airport to catch your flight." "Sure," I say. "My insomnia would make that quite possible." The interview goes well. I enjoy talking about how Halifax could perhaps benefit from doing some "road diets." And converting one-way streets back to two-way operation. A cab then whisks Maureen and I off to the airport to catch our plane. We are astonished to find that the flight is NOT cancelled. Overall, we found Nova Scotia to be a place with very friendly, helpful, generous people. Worrisome, our Bed & Breakfast host tells us, is the fact that their economy is seeing a decline in boat-building, fishing and farming. And being replaced by "high tech" jobs (and immigrants filling those jobs without necessarily having the admirable traits of Nova Scotia natives). 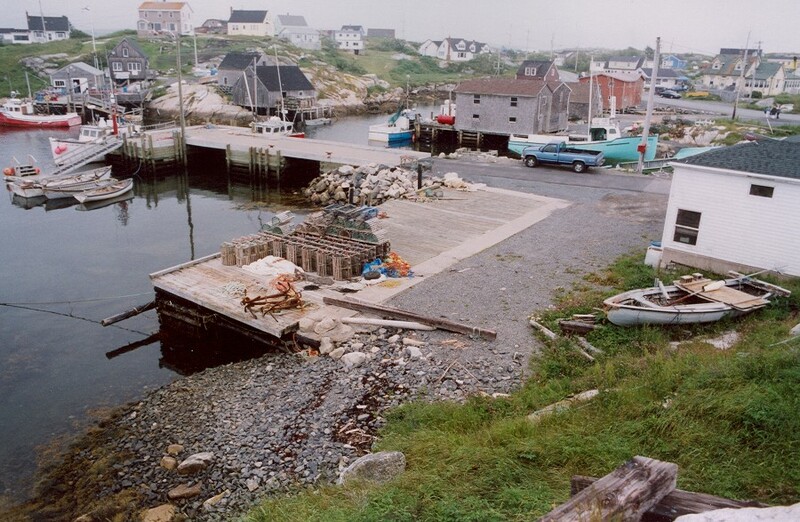 It is unclear that the authentic charm of Nova Scotia, and the friendly nature of its people, will survive such a change.